I am a fan of The Rebelution website and its founders Alex & Brett Harris, two 19 year-olds purposing to make a difference and challenge teenagers to rebel against low expectations and serve the Lord in big ways. So I was so excited to see their new book, "Do Hard Things," in Wal-Mart last Friday--yes, Walmart! I snatched it up and plowed through it in a couple of days. I believe that this is a must-read for every teen, tween, parents of teens & tweens, future parents of teens & tweens, or just anybody that works with youth. For that matter, I think that anyone would be challenged by the passion and boldness of this book! As parents of a 9 year-old son and 6 year-old daughter, my husband desperately seek to fill our children with the Truth and challenge them to know and serve Him intimately and passionately. I never want to fall into having low expectations on how God might use their lives, the gifts and abilities He has given them. In working with college students for over 12 years, I see also in them such a desire to do something meaningful. If that isn't cultivated, stagnation sets in. At 34, I feel that in my own life. We want our lives to be meaningful and purposeful in light of eternity! This book challenges teens, in particular, to "do hard things"--not to be satisfied with the low expectations that our culture places on them. It gives inspiring examples of past and present-day teens who are choosing hard things--and accomplishing extraordinary things! Then they challenge teens to look critically at their own lives and how they can do these hard things in their own lives. Receiving praise from people like C.J. 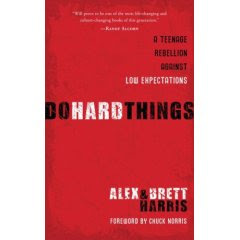 Mahaney, Albert Mohler, Randy Alcorn, and Mark Dever, "Do Hard Things" is really a fantastic book that I would recommend to all teens and those who love and work with them. As Christians, may we have higher expectations for teens and challenge them to "do hard things." Ultimately, may we model doing hard things for them! We serve an amazing and sovereign God who limitless in how He can work through willing servants to further His kingdom! Thanks for the review. I love their site and wondered how the book was. As a youth worker and future mother of teens, I will definitely check this out. Sounds excellent! I want to do those 5 hard things myself!!! I just got this book last week. I can't wait to jump in! I just recommended this book to a friend of mine with teens who are struggling. Thanks for the tip that it's available at WalMart. I don't yet have teens, but what seems like years away will probably be more like tomorrow. Thank you so much for this recommendation. With approval from juggernauts like Al Mohler and Mark Dever (he's the pastor at my brother's church), I am really excited about reading this! I'm excited, my book just came yesterday. I'm going to read through it then pass it on to my kids to read. When I first heard about this book, I thought it sounded good, but I figured that it wasn't for me "right now," since I am still about 10 years away from having a teenager in my home! But, like you said, I want to model doing those hard things...and that has to start long before she becomes a teenager! My girls and i are reading it now! We love it! We are headed to their conference this June...we are really excited about it! Great review, Kelly! This sounds like an excellent read and tool for teens and adults. Thanks for the summary and your opinions. It really makes me what to read it with my teen. Wow. That sounds amazing. I know I myself need to work on modeling doing the hard things! Thanks for letting everyone know about this book and for reminding me to press in and be willing to do more for the Lord. :) My own girls are watching me. I need to think about what they are seeing. OH thank you for recommending this book Kelly! I am a fan of the Harris boys as well...they were so vocal in support of Mike Huckabee..that is how I first noticed them...they are amazing boys! I will be buying this book too! I'll have to check out the Wallymart! This is something my husband and I have talked about a lot recently. This whole idea that kids/youth/college age, are just supposed to be having fun. When do they ever grow out of it? I am afraid we already are seeing too many adults who never do. I loved this book and found it challenging not just as a mom desirous for her boys to do hard things for the glory of God, but also as a follower of Christ myself! the book was great, we bought 20 to pass on to some of the students that we get to enjoy for graduation presents!! thanks for recommending it! Hi Kelly! I hope you and your family are well! How did you get this image into your post?